Parrot makes an exciting line of quadcopters, and both pro and hobbyist are excited when there’s a new release. The Parrot Bebop Drone is a great device to have fun on the field, but still record professional quality film. 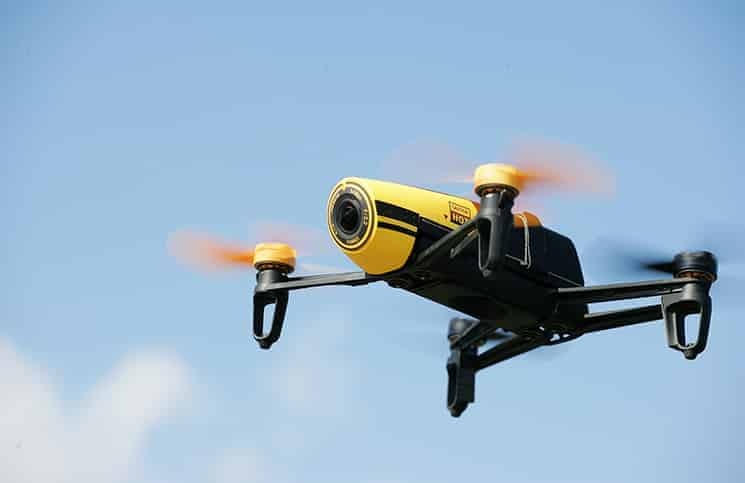 The Parrot comes in a distinctive yellow and black or blue and black plastic casing, with two yellow propellers, and two black, which help you with its orientation in the air. The Parrot Bebop quadcopter is lightweight, and is built with safety in mind. Parrot is concerned about collisions, which may involve people, or pets, on the ground. It’s built with a feather-weight ABS reinforced structure that weighs no more than 400 grams. Should the Parrot Bebop quadcopter collide with anything, the propellers immediately stop? The emergency mode then takes over, to take your quad down for a landing. This is particularly handy if your quad hits a tree. There is also a handy return to home function, so that the GPS can quickly bring the quad back to its starting point. The Parrot Bebop quadcopter can be flown indoors and out. If you wish to fly it inside, you can attach the EPP hull. It makes indoor flights safer, and protects your walls and furniture. It has a built-in full HD video camera. It’s stabilized on three axes, so your video will be free of vibrations, and jerkiness. You have the ability to watch live streaming video directly from your smart phone, or the Skycontroller, so that you have FPV—first person view piloting. You’ll be able to take the best aerial photos and video, even if you’re a beginner. The camera has the ability to take fourteen megapixel photographs. The drone is equipped with a special fisheye type of camera. It can record videos and take photographs in an 180 degree visual field. You’ll get exceptional image resolution. The built in image stabilization technology will allow you to take the most clear and stable video possible, even when your drone is flying through the air. The camera lens is protected by a splash and dust proof lens. You won’t have that additional issue of a horizontal line distortion, which is so common with action cameras. Anti-vibration technology will keep your photos looking professional. The video and camera can be controlled via a smart phone or smart app device. The user will be able to control the view up to 180 degrees. You can control the angle of the piloting application with a minute flick of the thumb. Your control of the camera won’t affect the drone’s flight. You’ll be able to immediately share your snapshots and video on Facebook, Youtube and Instagram. The Parrot Bebop drone outperforms the Parrot AR.Drone 2.0, with an overall increase in performance. It has a better onboard computer. Its navigation computer has a Parrot P7 dual-core central processing unit. Built into the core of the drone is a quad core GPU, with eight gigabytes of flash memory, to store the fabulous photos and video you’ll be taking. These electronics are attached to a magnesium shelf. This prevents the board from bending, during those crucial flips and rolls. The Parrot Bebop utilizes the Linux SDK operating system. 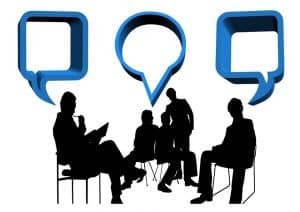 The operating code can be utilized by other developers. The Parrot Bebop quadcopter is able to generate a Wi-Fi hotspot. It operates on two different frequencies: 2.4 and 5 GHz MIMO. If you experience any interference on one network, you can try the second one. If you wish to bring your Bebop on your travels, the drone is easily disassembled. All the parts come out, and you can easily pack them up. Imagine being able to take beautiful videos and photos on your vacation! The Parrot Bebop quadcopter is extremely stable in the air. This doesn’t compromise the maneuverability though. The drone can analyze data from multiple sensors, such as the three axis accelerometer, the gyroscope, magnetometer, and an ultrasound sensor that has an eight meter reach. This is also a pressure sensor to detect surrounding objects and ground, with a vertical camera that measures the speed of the Bebop. Combined together, you’re in for an amazingly stable flight experience. Drone flight time is also very good. The Parrot Bebop quadcopter has the return home function that you expect in all higher-end models of quadcopters. Simply select “return home” on your screen, and your drone will immediately fly back to its starting position on the ground. The drone will then hover two meters from the ground, awaiting your further command. You can control photos and videos on your smart device, through the use of the app called Freeflight 3.0. This app is free, with the purchase of your Parrot Bebop quadcopter. It works with iOS and Android smartphones, and tablets. The app is user-friendly, so you can ensure you’re snapping your photos, and filming, but you can still focus on flying your Parrot. From the convenience of your smart device you’ll be able to control the piloting, photos and videos, and user settings for altitude and speed. The app should soon be available on the Windows phone as well. From the convenience of your app, you’ll have access to menu, settings, flat trim, flips options, recordings, photographing, the control pad, digital camera tilt, speed and altitude, take off and landings, and GPS, WiFi, and battery signals. You’ll be able to back up all your data to the Parrot Cloud. This gives you the ability to share videos and photos with other Parrot users. It provides a free back up of your data, so you don’t have to worry about losing precious footage. 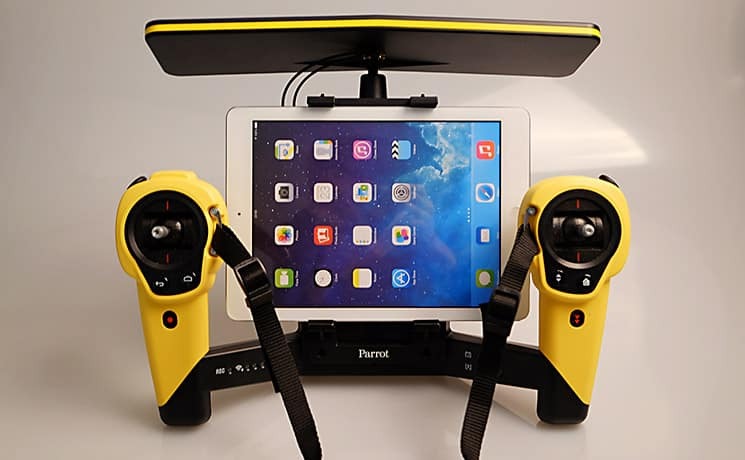 If you don’t wish to use your smart phone to fly your drone, you can use the Parrot Skycontroller, which has a built-in LED screen. Is the $200 Price Tag Worth It? The Parrot Bebop drone is more of a toy for adults than kids. Most won’t want to entrust a pricy model to their kids without at least some adult supervision. And most adults will enjoy flying the Parrot Bebop drone, as it looks more like a professional drone than a kid’s toy. It’s red and black, or yellow and black color choices are bright and easy to see in the air. The adult fan won’t be embarrassed at flying one out in public. While the Parrot Bebop may not be the best choice for the beginner, the expert or the pro drone pilot will find plenty of features to hold their interest. While this drone is a bit more compact than other drones in the Parrot range, you’ll find that it’s lightweight, and easy to pack into a bag or carrying case. This may be the better option if you enjoy plenty of outdoor activities. Having the ability to photograph and take video of your hiking and skiing experiences will make the hobby that much more enjoyable. Overall, most people will be pleased with the Bebop drone price, particularly with the addition of a second battery pack. You can plug the Bebop Parrot into your laptop or computer to update its software. One great feature is that it will update to meet FAA requirements. While it may be simple to see an airfield where drone flying may be prohibited, sometimes if there’s greenery, or hills, it may be difficult to see a military installation. The Parrot Bebop will automatically avoid these prohibited spaces, thus saving you the aggravation that your Parrot Bebop may be taken from you, or worse, you being arrested. There are other safety features built in. If you get tired and are ready to head for home, or perhaps your drone has extended its range from the controller, it will automatically return to its starting position with the “return to home” feature. While a great drone camera will help to achieve great photos you also need something to help stabilize it, so that video and film images are not blurry or crooked. The built-in three axis image stabilization will help you to take crisp clear photographs and video. There is support on the website to help keep your quadcopter in the air. Here you’ll find firmware updates for your smart phone, or device. 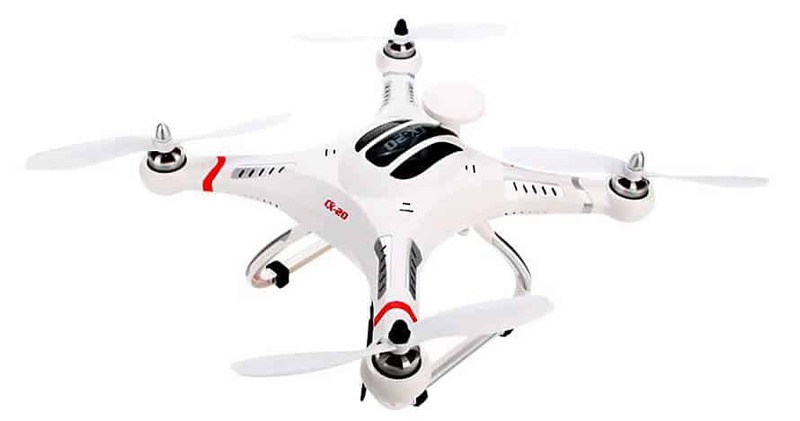 Online you can view a gallery of Parrot Bebop quadcopter user photographs and videos. There is also a Cloud Pilot Academy, which will help with your flying maneuvers.